Maybe this journey, from Miss to Mrs has been something you have dreamt about for your whole life. Or maybe it was a total surprise. Maybe the proposal literally swept you off your feet and you have no idea what you’re supposed to be doing, when you should be doing it, or how on earth you’re going to pull all this together! Hopefully, I can make at least one aspect of your day a little less stressful for you, and that’s by providing you with an absolute guarantee that you will look amazing. Those photos that you’ll be showing your grandkids in fifty years time …? You’ll be able to look back on them and know that you looked and felt like the very best version of you. Theres a lot to think about – how you want to be seen, what type of bride you want to be. Whether your interpretation of being a bride is subtle, chic and understated, or whether you cant wait to ‘Wow’ as you walk down the aisle , I can help you create your perfect bridal vision, and bring that vision to life. My role as a wedding hair stylist and make up artist is to do just that. I transform women from their everyday selves into the most beautiful of brides…. And I take great pleasure in it. Everything we do is bespoke to you. It’s all about attention to detail. 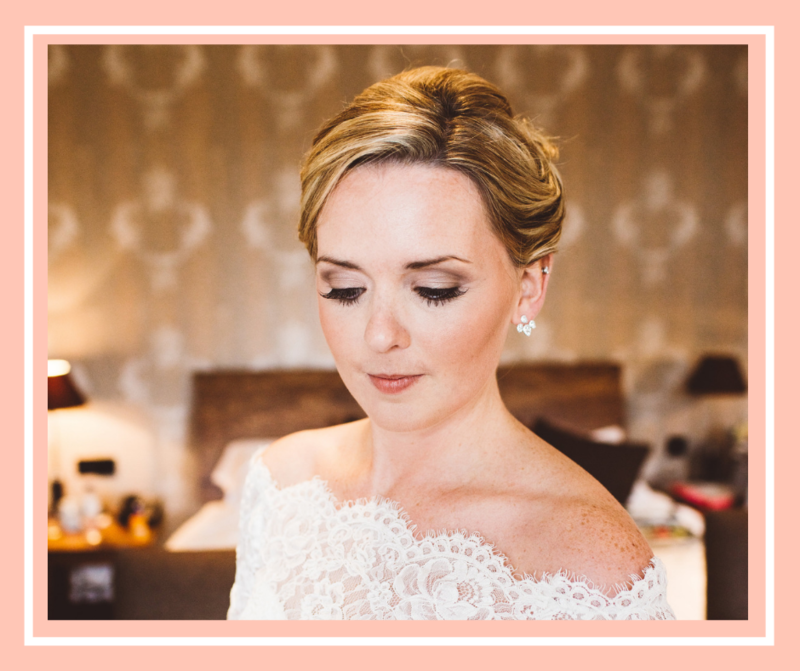 There’s something very special about seeing you step into that dress, with your hair in place, your make up flawless – and watching you catch your breath as the realisation hits…it’s all finally come together, and now you are a bride. One of the biggest compliments I receive is when a bride sees herself in the mirror for the first time on the wedding morning and says ‘I can’t believe its me, I just can’t believe that I can look like this’…. It’s not about making you look different, it doesn’t have to be drastic to be beautiful. It’s simply about making you feel as amazing on the inside, as we can make you look on the outside. You don’t need to wear something you usually wouldn’t, or style your hair in a way that you usually don’t. If you feel comfortable, you will be confident. Confident in the knowledge that you look the very best that you possibly could. I’ve provided hair and make up services to a countless number of brides over the past few years. Some know exactly what they want, others not so much! Whatever category you fall into, rest assured that we are able to work together to create something totally unique just for you. No two people are the same, no two faces or two hair styles are the same. Your wedding style will be as individual as you are. Of all the things you have to worry about on your wedding day, how you look needn’t be one of them. I use a variety of professional products and premium brands to ensure that you look as perfect at the very last dance, as you do at the very first look. Your wedding morning is an event in itself. The last few hours of being a ‘Miss ‘ are an occasion to be celebrated and you want to enjoy them the very best you can. Having someone who is able to create the look that you want helps take away any unnecessary stress or worry. I often cater for larger bridal parties that might include parents or guests as well as bridesmaids and other members of the bridal party. Whatever or wherever your requirements are, simply get in touch. I only work with one wedding per day and this means that my time is devoted to you and your needs until the final moments before you head off down the aisle. If you think that you would like me to join you on your wedding morning then please don’t hesitate. You can download my brochure below or contact me. The way you look on your wedding day and the memories that go with it will last you a lifetime, I’d love to be a part of that. Click below to download my Wedding Brochure for 2019/2020 and get your name on the list so I can keep you updated with all things bridal! In a rush to get booked?! You can gain instant access to my pricing by clicking the ‘Pricing’ tab in the footer of the website.